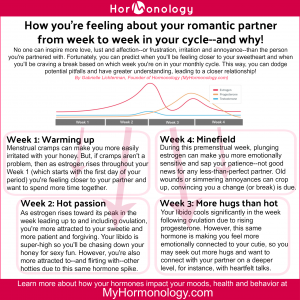 Hormonology Cheat Sheet: How do you feel about your relationship from week to week? Ever wonder why you feel close to your honey one day, but then everything your partner does drives you up a wall the next? A key part of it has to do with where you are in your monthly hormone cycle! Here’s my newest Hormonology Cheat Sheet that reveals how your hormones impact how you feel about your sweetheart–and why! Give me one reason not to! Sign me up!